Make your reservation online today! Open year round, seven days a week. Unlike some of the more commercialized resort areas, we offer total privacy while providing the usual comforts of home. 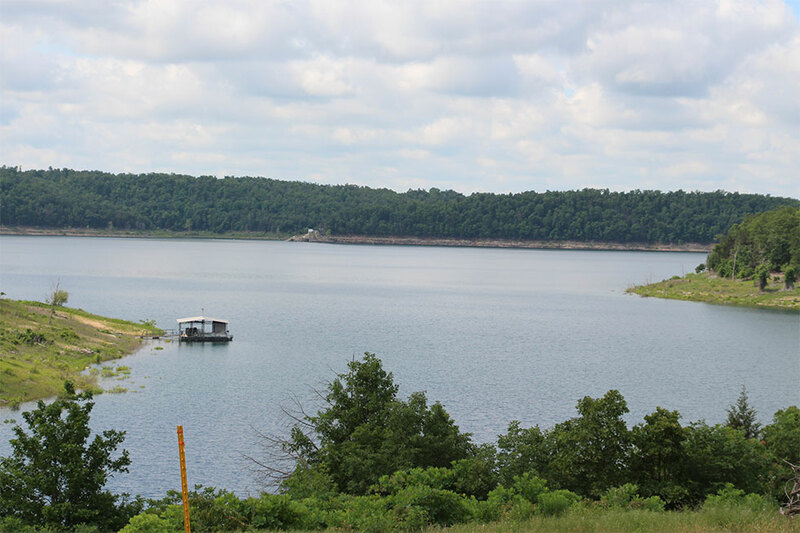 Located in the Promise Land Area of Bull Shoals Lake, the resort covers five waterfront acres and provides a beautiful blend of rolling hills and tree shaded landscapes. Each of our 8 cabins is set along the waterfront for a beautiful view and relaxing vacation. Our lighted, covered boat dock is here to facilitate all of your fishing and boating needs. Each of the dock’s 16 stalls is equipped with its own electrical outlet. A concrete launching ramp is available to get your boat into the water with ease. Once you’ve caught your limit, there is a complete fish cleaning station right on the dock. You can also rent our pontoon boat, bass boat or fishing boat and motor. Some people consider Bull Shoals Lake the Walleye capital of the South. Lunker, Largemouth, Smallmouth, and Kentucky Bass also swim the lake’s crystal clear waters. Crappie, White Bass, Catfish and others are found here as well. The folks at Reel-Em Inn @ Chit Chat Chaw Resort have over 50 years of fishing experience to share with you. We stay updated on where the hot-spots are, what techniques work best, what lures to use, what time and how deep to fish We offer guided fishing tours as well. We have a large, lighted pool which is great for a day of swimming or sunbathing. After a long day out on the lake, take an evening swim to relax and cool off. We also have a playground, horseshoes, board games and a variety of yard games for your amusement. Our waterfront cottages are fully equipped and furnished. We offer clean, comfortable accommodations, many with beautiful knotty pine interiors. Each cottage is provided with linens, towels, dishes, cooking pans, a microwave, a coffee maker and more. For your added comfort each cottage is equipped with a stove, refrigerator, air conditioning and a TV. Outside each cottage you will find a picnic table, a full-size charcoal grill and your own private patio overlooking Bull Shoals Lake.